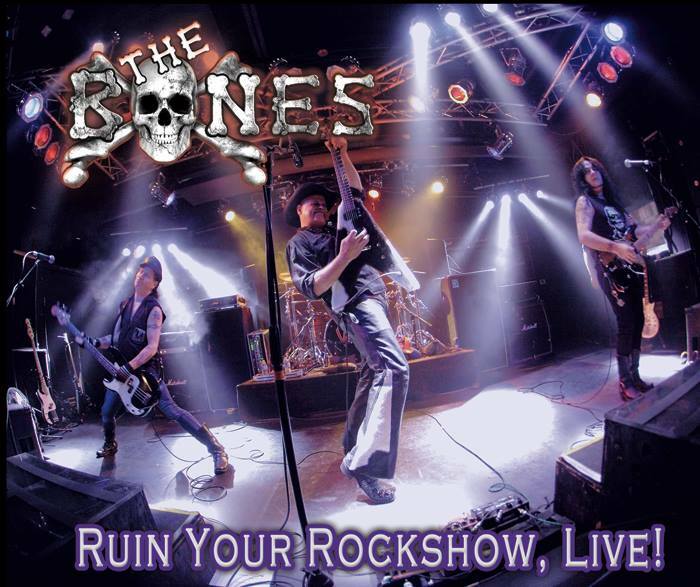 Ruin Your Rockshow Live is the second album from the Bones, recorded live and comprised of cover songs. In recent years around Vegas, the Bones have been making a name for themselves. The band lineup has changed a few times since the group first formed, but currently features Jeff Duncan (Odin, Armored Saint, DC4) on guitar, Shawn Duncan (Odin, DC4, Bulletboys) on drums, Sean Koos (Joan Jett Band) on bass, and Patrick Vitagliano (Nuclear Theory) on guitar and vocals. To date, the band has recorded one studio album, What Would Ginger Do, released in 2013. The thing I noticed in the early Bones shows (prior to them performing original songs) was their tendency to take overproduced, poppy hits and strip them down, reimagining them with a raw, punky vibe that was largely the antithesis of the original track, yet somehow staying fairly true to it and keeping it recognizable. It definitely helped them to stand out from the other Vegas bands performing the same generic 80s metal covers songs day in and day out. It is always good to see a band doing something different that works! The group’s first album was all original material; which in my initial review I had likened to a “power pop” sound of sorts, almost like a heavier version of Cheap Trick. The one thing missing from an otherwise solid debut record was cover tunes, reinvented the way the band likes to do them. Fortunately, Ruin Your Rockshow Live delivers in that regard. On Ruin Your Rockshow Live, you get 17 cover songs from the band, done up live on the Vegas stage. Of course, the band gives them their classic treatment, taking what are mostly overproduced 80s pop hits, and stripping them down, giving them the reinvention in a heavier, more punk oriented sound, at quite the opposite end of the spectrum from the originals. Songs covered include tracks from the Bangles, Psychedelic Furs, the Beatles, Wham, Cyndi Lauper, Simple Minds, and even Prince! The diversity of the tracks selected shows just how good their system of reinventing songs is. You also have to give the band credit for their sense of humor. You will hear some rather comical quips in a few places on this record – “This is an hour of your life that you can never get back!” Yet despite the “funny moments,” the band has genuine talent on deck. The Duncan Brothers are great no matter what band they are in, and having them reunited here is an unexpected surprise. The real standout here is frontman Vitagliano, who has a very distinctive, raspy voice that dominates every track on the release. If a band is going to record cover songs, this is the way to do it; reinventing the songs while at the same time staying true to the original versions. There really are not any weak moments in the mix; these reinventions of these songs are surprisingly enjoyable! In keeping with the band’s own brand of musical reinventions, the production on the CD never feels overly polished; it actually feels “live.” If any overdubs or anything of the sort was done here, it was done the right way and does not interfere with the live feel of the release. Essentially, the disc sounds the way it should. The Bones are a fun band to experience in concert or on a disc, and this new live effort features some of their best cover songs to date. 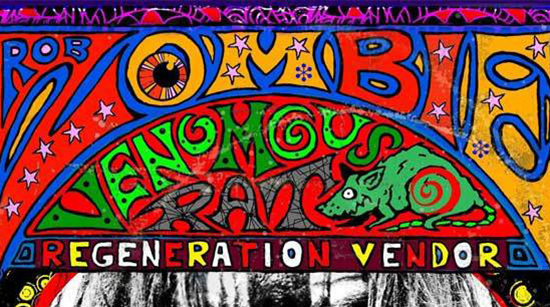 There is a lot of talent on deck here, but as a band that does not take themselves seriously (at least on the surface) there is a lot to enjoy here. The way they reinvent these classic, cheesy pop song and put their own spin on them definitely sets them apart from other bands, making Ruin Your Rockshow Live essential listening! TagsDon't You Forget About MeI Melt With YouJeff DuncanLet's Go All The WayPatrick VitaglianoRuin Your Rockshow LiveSean KoosShawn DuncanThe BonesWhat Would Ginger Do? Elefante - The Latest Studio Release from Marq Torien and the Bulletboys! Architects of Chaoz - Former Iron Maiden vocalist Paul Di'Anno is back again! 12 Strong: American Soldiers Strike Back.... But Does the Movie Offer Anything New?